The WeatherTech AlloyCover is a lightweight foldable hard truck bed cover for those looking to maximize security and durability without compromising style and aerodynamically-friendly qualities. This low-profile hard truck bed cover features an easy-to-use tri-fold design, which makes for effortless installation and removal. The Alloycover also features the AutoLatch II latching system that when paired with a locked tailgate provides excellent security. To further protect your cargo from unwanted access or vulnerabilities, the bed cover incorporates strong aluminum panels with durable, watertight, reinforced vinyl coated hinges. Each panel is made from aluminum alloy commonly found in commercial trailers – yeah, we got you covered! With our products, we like to think it’s better to be seen than heard, which is why the hard truck bed cover is carefully designed to reduce unwanted vibrations and excessive noises commonly found in most bed covers. To solve these issues, we incorporated flexible rubber seals, vinyl coated hinges and reduced metal-on-metal contact allowing for a nice, quiet ride in front. 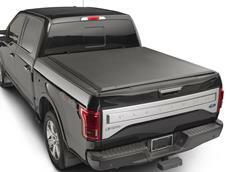 The truck bed cover sits less than half an inch above the truck bed and incorporates a textured matte black finish that blends with your truck's OEM bed caps to provide a sleek, consistent look. The water-shedding design and waterproof, reinforced vinyl coated hinges route water away from the bed without gutters or drains. The hard truck bed cover overlaps the bed rails with a continuous seal along the entire length of the side rails, preventing elements from entering the truck bed. Extruded aluminum channels support the panels to hold up to 400 pounds of evenly distributed weight, while weighing approximately 50 pounds for a high strength-to-weight ratio. Sleek, retractable storage clips hold the hard truck bed cover secure, while rigid standoffs with rubber pads keep panels properly spaced in the folded position. No adjustments needed. Thank you for looking at our AlloyCover Hard Tri-Fold Truck Bed Covers. The fact is they are made for us by an expert American company, to our specifications. Our contract with our supplier requires us to offer a 3 year warranty on our AlloyCover Hard Tri-Fold Truck Bed Covers, which of course we do. But we would really like to offer you our Lifetime Limited Warranty, like we do on everything else we sell. The reality is, if you, as our customer has an issue that would be covered under our 3 year warranty, after the 3 year warranty has expired, we are going to do everything in our power to help you out, and make you smile. You're a WeatherTech customer and that means a lot to us. Is the AlloyCover waterproof? Will snow seep through if accumulated? No aftermarket accessory can be guaranteed to be water proof, but it will be very difficult for water or snow to get in when the cover is correctly installed and closed. Will this product fit with a tool box in the back? Only if the tool box is below the rails and not installed to the height of the rails. Are there places near my area that will install the AlloyCover? Most installation shops could install the product, but they will most likely charge for it. Yes, both installation and removal can be accomplished in minutes. What keeps the AlloyCover from unfolding when it’s folded up and the vehicle is moving? The AlloyCover will lock into place with the integrated storage clips. What is the weight and can I lift this by myself? While this product offers a simple one person installation and removal, the shipped product ranges from 55-76 lbs. We suggest a two person installation for greater ease and accuracy. Will the finish fade in extreme temperatures? The product should not fade in the temperatures we see throughout the United States. It is also UV resistant to withstand the harshest sun climates. What can I use to clean it? You can use any product that you would normally use to clean your truck, or we recommend our specially formulated TechCare® Gentle Car Shampoo. Aluminum Alloy will not rust. Will it fit with a spray-in liner? Provided that the spray-in liner does not go up over the sides and is professionally installed, the AlloyCover should fit. Why is shipping so expensive? What is the delivery timeframe? The box is considered oversized, and shipping is charged by dimensional weight. The delivery timeframe is a minimal 5-7 business days. Other bed covers offer a stand-up-to-drive option, will yours offer this feature as well? Our goal is to not block your total rear view. That is why we designed ours to come off the truck very easily – no tools, just a pull of the 2nd dual latch located under the last panel. There are no drain tubes illustrated in the photos. Does this indicate the AlloyCover has a design that does not allow water to get down into the frame channel? Correct, no drain tubes are required because our cover seals at the bed caps. The rails are designed to shed water as well, while the hinges themselves are indeed waterproof. Are the panels replaceable if damaged? If damaged, the panel assembly would have to be replaced. With a locking tailgate, as most are today, it is a secure system meaning you have to open the tailgate first in order to gain access. Keep in mind though that using a tool like a crowbar can most likely pry into the cover and allow entry. Will it rattle while the vehicle is in motion? If the AlloyCover is properly installed, you shouldn’t hear rattling or exterior noise. Can hail damage the AlloyCover? The AlloyCover is made from aluminum that is 22% stronger than Ford OE aluminum bodies. Nevertheless, it would depend on the size and speed of hail and we cannot guarantee that the part would not be damaged in an extreme storm. Which TechCare product can be used to clean the AlloyCover? The TechCare Gentle Car Shampoo would work well to lift dirt and road grime, and the QuickTech Detailer with Carnauba Wax details the surface and protects against UVA and UVB rays. On average, how much time is needed to install the AlloyCover? This really is dependent on the installer’s familiarity with the vehicle and comfortability with installation. Nevertheless, even with limited knowledge, it ranges from 30 minutes to 1 hour. How much weight can the AlloyCover hold when closed? The AlloyCover can hold 400 lbs. evenly distributed. Will the AlloyCover work with the built-in tailgate step? Yes, as long as it is an OE version. Is the AlloyCover stable for 50+ mph winds? If properly installed, the AlloyCover should be able to withstand 50+ mph winds. Nevertheless, it would depend on the gusts and we cannot guarantee that extreme weather conditions would not damage the part. Where does the water go after pooling on top? The water shedding design of the AlloyCover should eliminate pooling. Regardless, the hinges are waterproof and water typically sheds to the outside of the bed. Is the AlloyCover more low profile than the Roll-Up Cover? The AlloyCover has more than a ½ inch lower profile and this contributes to the part’s appealing and seamless look.